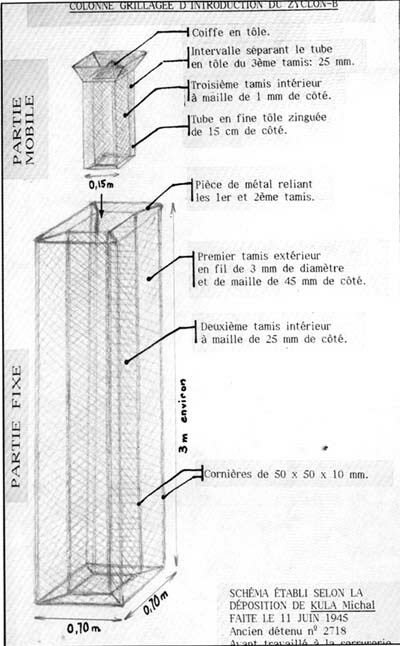 Space between the metal tube and the third lattice: 25 mm. Metal strip joining the first and second lattices. First, external, lattice of 3 mm diameter wire, 45 mm mesh. Second, interior, lattice of 25 mm mesh. Based on the deposition of 11th June 1945 made by Michal KULA, former prisoner 2718 who worked in the metal working shop where these columns were made. 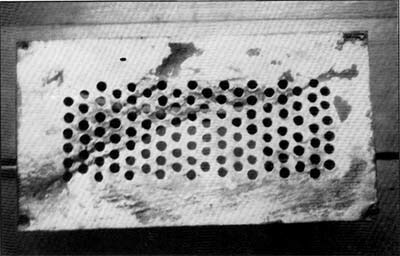 Perforated galvanized covering one of the upper (fresh air inlet) ventilation holes of Leichenkeller I of Krematorium II or III dimensions: 7 × 13 cm. Leichenkeller 1 of Kr II had 50 of these (metalworking shop order no. 83 of 18/2/43, completed on 15/ 3/43), and that of Kr III 95 (metalworklng shop order no. 192 of 15/3/43, completed on 22/3/43). They were simply fixed by four nails across the rectangular openings cut in the wooden conduits through which fresh air arrived. Kept in the PMO “Reserve Stocks”, in block 25. 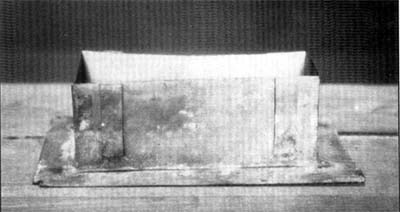 Rear view of the same object. 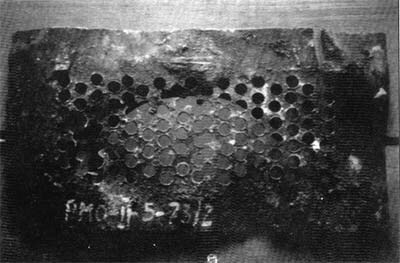 Remains of an upper ventilation hole cover,classified PMO II-5-73/2, kept in the PMO “Reserve Stocks” in block 25. Its “home made” nature is very evident.